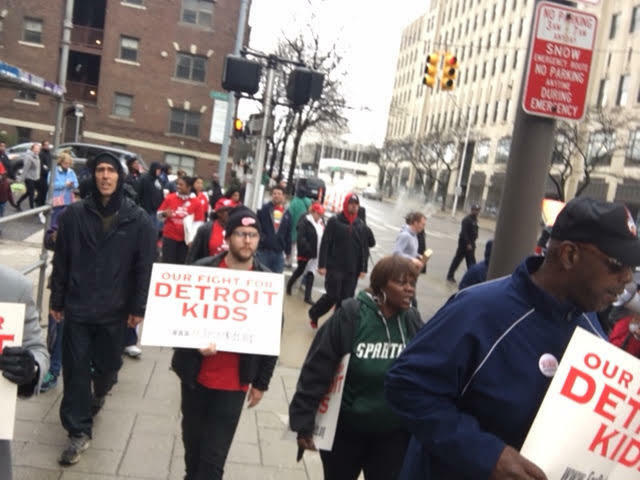 Detroit teachers protest in front of the Fisher Building, home of DPS administration. Nearly all Detroit Public Schools are closed again today, as too many teachers called in sick to protest being asked to work without guaranteed pay. It's the second straight day almost all the district's 97 schools have been closed. 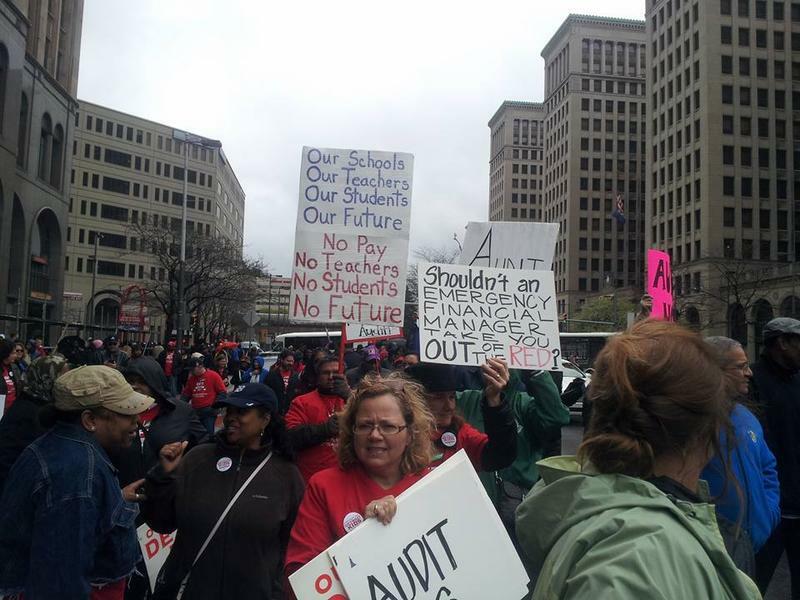 Teachers have known for months that Detroit Public Schools will run out of money after June 30, unless Michigan lawmakers approve hundreds of millions of dollars in long-term aid. But anger boiled over when they found out just days ago that most teachers might not get paid their full salaries for the current school year. Back in March, Michigan lawmakers approved $48.7 million to keep Detroit schools open at least through the current school year. According to DFT officials, the understanding was that would cover all payroll expenses for the school year — including the many teachers who elect to be paid year-round. But when district officials told union leaders just last Friday that’s not the case — and that as of right now, those teachers who are normally paid during the summer are effectively working the last few weeks of the school year without guarantee pay — many union members pushed for a mass sickout. Sporadic sickouts held earlier this year to protest the district’s deterioration under state oversight were never formally sanctioned by union leaders. But this time, DFT leadership encouraged the action. 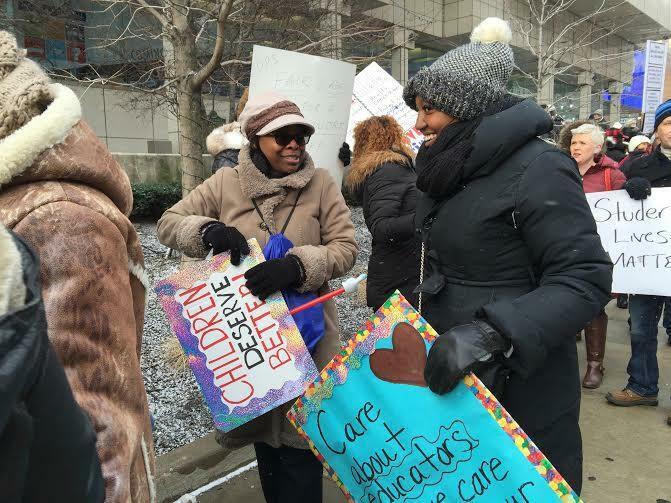 “Unfortunately, by refusing to guarantee that we will be paid for our work, DPS is effectively locking our members out of the classrooms,” said DFT interim President Ivy Bailey. 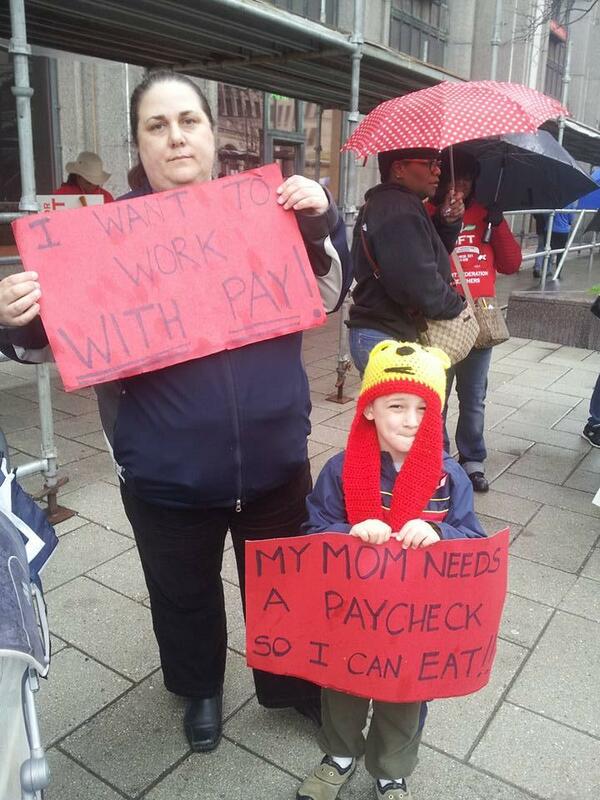 Chanting “No work, no pay!” and “Shut it down!,” hundreds of DPS teachers, staff and supporters filled the streets outside district headquarters at Detroit’s Fisher Building Monday morning. DPS speech pathologist Christine Goletz and her son. She says teachers have been patient for years, taking cuts as state-appointed emergency managers have tried to stabilize the district’s finances. Goletz says being asked to wait while the state figures out if teachers might get paid is a bridge too far. “It’s ridiculous. I’m at the point where, I’m actually from Canada, [and] I’m thinking about moving back there. Because I can’t take it anymore here in Michigan,” she said. It’s not clear what further actions teachers might decide to take at Tuesday’s meeting. But a core group of teachers has a list of demands they want met before they agree to go back. They include guarantees of full pay, and a forensic audit of the district’s finances under a succession of five emergency managers. “The teachers are not the ones stealing the money. The state of Michigan is the ones stealing the money. And we really need to find out where that money is,” said Courtney Valentine, a teacher at the Detroit International Academy for Young Women. But district leaders called the sickout misguided. "I understand the frustration being felt by our educators, and I am on record as saying that I cannot in good conscience ask anyone to work without pay. Nevertheless, it breaks my heart to think about the major impact that the closure of 94 of the district’s 97 schools is having on our students and their families,” DPS emergency manager Steven Rhodes said. State House Speaker Kevin Cotter had a much harsher analysis, saying teachers’ actions made state lawmakers less inclined to help Detroit schools — even if the state is ultimately on the hook for much of the district’s debt, should it come to that. "These egotistical teachers have lashed out at the children who rely on them and accomplished nothing but disrupting their students' education," Cotter wrote in a statement Monday. "Their selfish and misguided plea for attention only makes it harder for us to enact a rescue plan and makes it harder for Detroit’s youngest residents to get ahead and build a future for themselves." DETROIT (AP) - The emergency manager for the Detroit Public Schools says the district will have no money to continue paying teachers this summer without further funding from the state. The Detroit Free Press reports that former bankruptcy Judge Steven Rhodes said in an email Saturday that the district also will be unable to fund summer school or special education programs after June 30. Rhodes was appointed by the state to oversee the district's finances. For the first time in months, Detroit teachers are planning to hold a mass sickout Monday—and for the first time ever, union leaders are helping lead the call for it. This comes after the Detroit Federation of Teachers leadership informed members that many teachers could end up shorted on their pay this year. The situation involves Detroit Public Schools staff who elect to be paid biweekly year-round, not just during the school year.